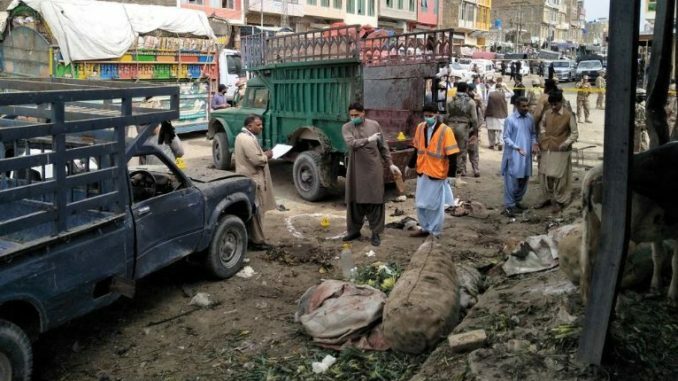 About sixteen people were killed when a bomb went off through a vegetable market in Pakistan’s Quetta city, in the southwest early Friday morning. At least thirty other people were injured in the blasts. No one have claimed responsibility for the blasts, however it’s suspected that a banned Sunni extremists group Lashkar-e-Jhangvi carried out the blast. The blasts mostly targeted a minority Muslim group comprising of Hazaras, the Hazaras have repeatedly come under frequent attacks. Successive governments who have come to power in the province of Baluchistan have assured Hazaras of safety, but failed. Police said Friday’s attack went off in a sack of potatoes and the victims included shopkeepers, and customers at the market. The market was crowded due to morning rush. One paramilitary soldier was also killed in the attack. The police ruled out suicide bombing instead they were investigating angles of remote control or a timer device that may have been used to trigger the blast.